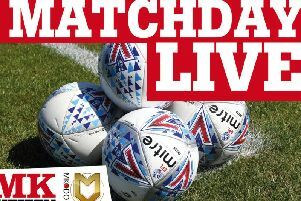 Ed Upson and Scott Wootton may not be offered new contracts at Stadium MK. Robbie Neilson said he was only in talks with Callum Brittain - another player out of contract in the summer - at the moment, throwing doubt over the future of Upson and Wootton. Upson has made 77 appearances in his 18 months at the club, while Wootton missed all but four games last season with a knee injury, and has made 26 appearances since his return. "We're speaking to Callum Brittain who we feel has a big future here," Neilson confirmed. "The other ones - to be honest, we have to see where we end up and see how the season progresses. "It's a bit too early, with the position we're in, to be offering deals at the moment. We'll look at that in the coming months." Meanwhile Neilson was hopeful of adding another new face to his ranks ahead of Saturday's clash with AFC Wimbledon at Stadium MK. Having already added Ike Ugbo from Chelsea last week, he said: "We're still working. Fingers crossed we'll get one in ahead of the weekend, we're just waiting to hear back. "There are another couple of options in different departments. We were very lucky to get one in so early, and if we can get another one in before Saturday it would be great. "We're looking in a few positions. I need one in midfield, one up front, and then we'll make a decision where I bring the next one in."